Merge your love with this Mesmerizing Thought of You Bouquet and send it to your dearest ones. Brighten your day with this happy and joyful Bouquet of 18 Yellow Roses decorated with Fillers and packed with Tissue. Make others feel your presence by sending this Majestic Garden of Dreams Bouquet and let them feel very delighted. 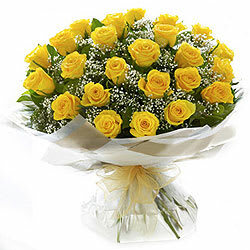 This Perfect handheld Bouquet is presented with 24 Yellow Roses decorated with Fillers and enfolded with Tissue. Make others feel your presence by sending this Majestic Garden of Dreams Bouquet and let them feel very delighted. This Perfect handheld Bouquet is presented with 30 Yellow Roses decorated with Fillers and enfolded with Tissue.